Whether on a diplomatic mission, military deployment, or a leisurely tour of Middle Eastern cities, join the conversation with Instant Immersion™ Arabic, the dynamic audio product on 8 compact discs. Providing effective, progressive instruction in all the basics of structure, syntax and grammar, Instant Immersion™ Arabic focuses on the Eastern Colloquial dialect, the dialect most prevalent in Arabic-speaking countries, and the closest to Classical Arabic. 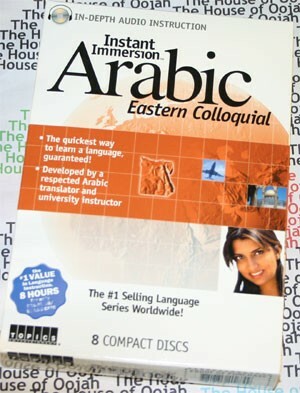 From introductory verbs to regional variations, this comprehensive CD collection ensures detailed language learning, all set to a lively lesson plan of practical Arabic vocabulary. We at TOPICS Entertainment are confident that these Instant Immersion™ audio recordings provide the fastest, easiest way to conversational fluency. With its focus on spoken language instruction, the listen to learn approach of Instant Immersion™ English Grammar & Pronunciation yields results fast! Developed especially for all non-native speakers of the language, Instant Immersion™ Arabic is the painless, practical path to correct Eastern Colloquial Arabic. With its emphasis on the building blocks of proper speech, this 8-audio-CD collection provides comprehensive, self-paced instruction in basic grammar, sentence formation, and conversational skill-building, from directions to doctor visits. Perfect for business, touring, or government service, Instant Immersion™ Arabic is designed to increase your language conÞdence, loud and clear! Arabic rabī) is the largest living member of the Semitic language family in terms of speakers. Classified as Central Semitic, it is closely related to Hebrew and Aramaic, and has its roots in a Proto-Semitic common ancestor. Modern Arabic is classified as a macrolanguage with 27 sub-languages in ISO 639-3. These varieties are spoken throughout the Arab world, and Standard Arabic is widely studied and known throughout the Islamic world. Modern Standard Arabic derives from Classical Arabic, the only surviving member of the Old North Arabian dialect group, attested epigraphically since the 6th century, which has been a literary language and the liturgical language of Islam since the 7th century. Arabic has lent many words to other languages of the Islamic world, as Latin has contributed to most European languages. And in turn, it has also borrowed from those languages, as well as Persian and Sanskrit from early contacts with their affiliated regions. During the Middle Ages, Arabic was a major vehicle of culture, especially in science, mathematics and philosophy, with the result that many European languages have also borrowed numerous words from it especially Spanish and Portuguese, countries it ruled for 700 years (see Al-Andalus). "Colloquial Arabic" is a collective term for the spoken varieties of Arabic used throughout the Arab world, which, as mentioned, differ radically from the literary language. The main dialectal division is between the North African dialects and those of the Middle East, followed by that between sedentary dialects and the much more conservative Bedouin dialects. Speakers of some of these dialects are unable to converse with speakers of another dialect of Arabic; in particular, while Middle Easterners can generally understand one another, they often have trouble understanding North Africans (although the converse is not true, due to the popularity of Middle Eastern—especially Egyptian—films and other media).